World premiering later today is one of the truly great films at this year's Human Rights Watch Film Festival A Quiet Inquisition. 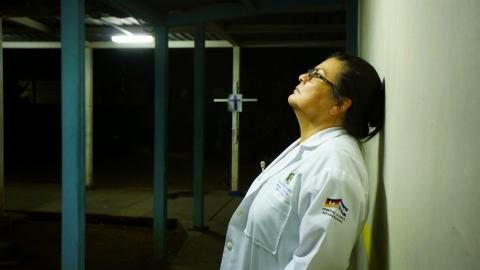 The film is the story of Dr Carla Ceratto a doctor in one of Nicaragua's public hospitals. Caring for all of the young women who are pregnant and on the verge of motherhood, Ceratto and her team have to tread carefully since the the country is one of only five in the world that completely bans abortion for any reason even danger to the life of the mother. The film is largely time in the wards with the good doctor and the women she is treating. Its a tough life where on some days she handles or oversees 60 births. The film is a quiet powerhouse and food for thought for anyone who is on any side of the abortion issue anywhere in the world. Showing very clearly what happens when all abortions are stopped the film presents its case in such a way that only a stick in the mud won't at least pause when faced with the long agonizing deaths of a mother. And the best part is that even on it's own terms, even just as a film and not taking its point of view into account, its a great film and a wonderful real life drama. The film is a gem and a keeper. Go see it. This plays tonight and the 20th. For more information and tickets go to the festival website. Great and important film indeed. Just two notes: the country is Nicaragua and the doctor name is Carla Cerrato.